Cellulose is the most abundant carbohydrate polymer on earth . 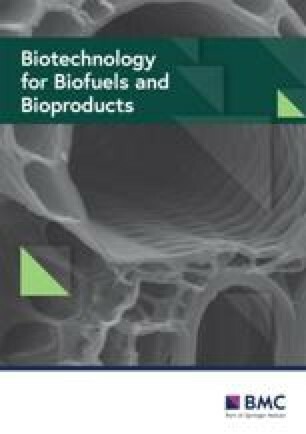 In recent decades, utilization of cellulose to produce biofuels, and functional molecules of interests have attracted numerous attention due to its renewable, carbon neutral, and environmental friendly features [1, 2, 3, 4]. 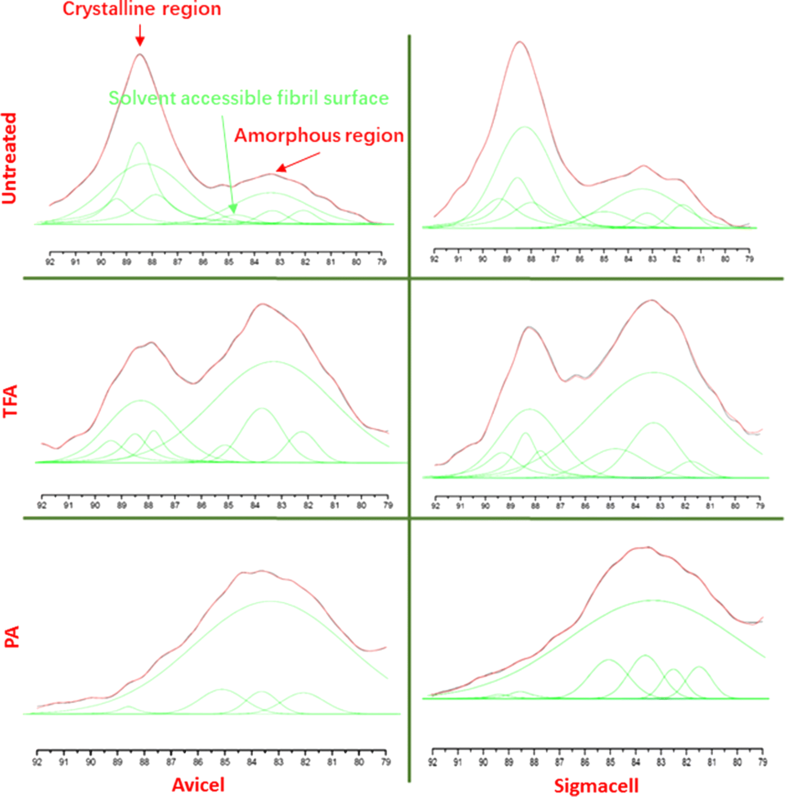 However, cellulose, a homopolymer of glucose, has a compact fibril structure possessing high crystallinity and extensive hydrogen bonds that are formed during biosynthesis which hinders the cellulose conversion efficiency [5, 6]. Pretreatment is required to make the compact cellulose structure accessible to enzyme or chemical catalyst to efficiently hydrolyze β-1,4 glycosidic bond [7, 8]. 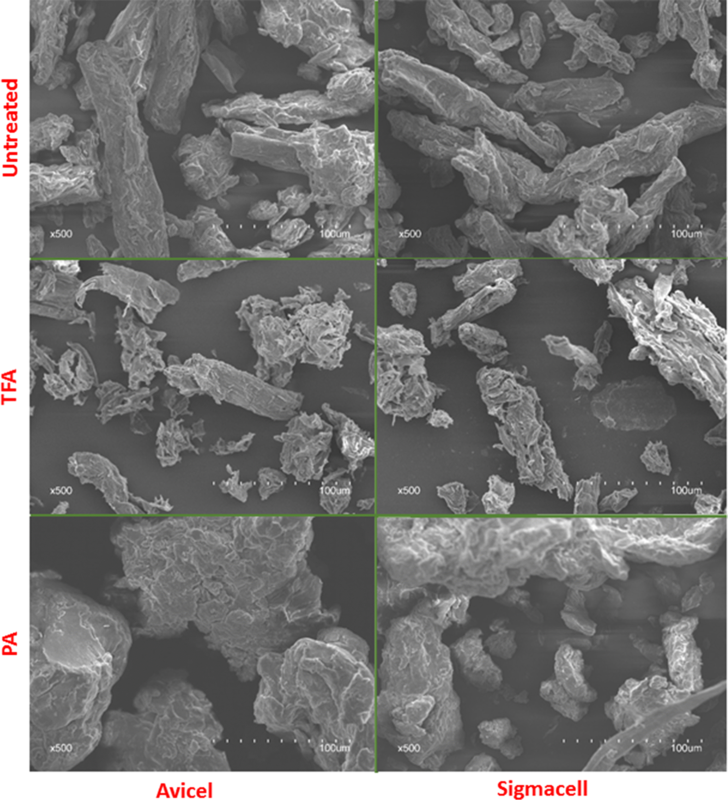 Unlike pretreatments such as dilute acid, ammonia fiber expansion, ammonia recycle percolation pretreatment demanding high temperature or pressure, and cellulose solvent- and organic solvent-based lignocellulose fractionation (COSLIF) can fractionate lignocellulose components at modest reaction conditions . 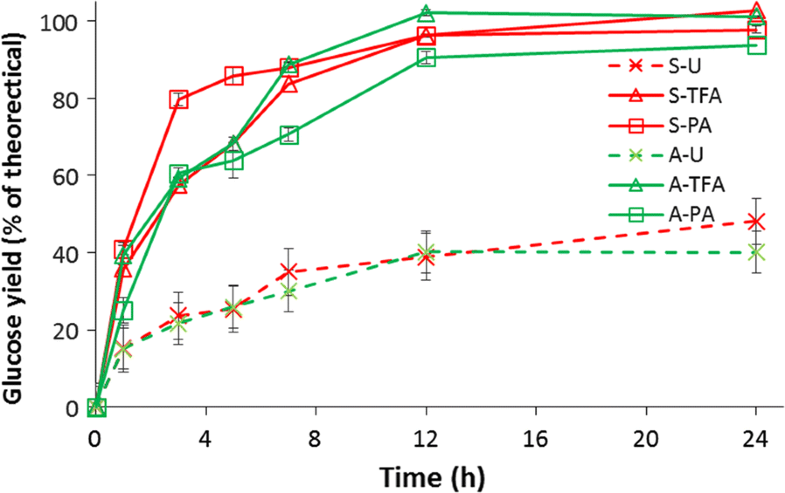 The previous study shows that concentrated phosphoric acid (PA) is an effective cellulose solvent . PA is a modest acid; under mild condition, cellulose can completely dissolve into it when its concentration is more than a critical value . The cellulose dissolving phenomenon is known as solvent swelling effect. 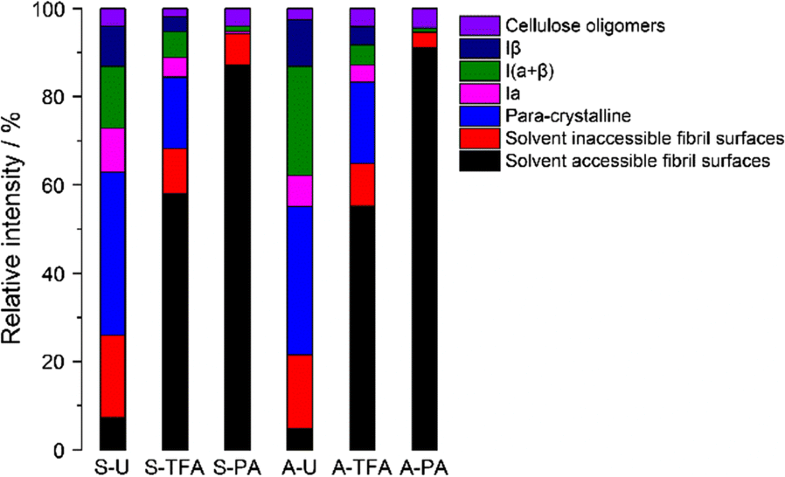 Similar as PA, swelling agent trifluoroacetic acid (TFA) attracts attention as it can effectively swell cellulose and be recycled due to its low boiling point, which provides an efficient and economical way to lower the cellulosic crystallinity and break up hydrogen bonds within the crystalline region [10, 11, 12]. 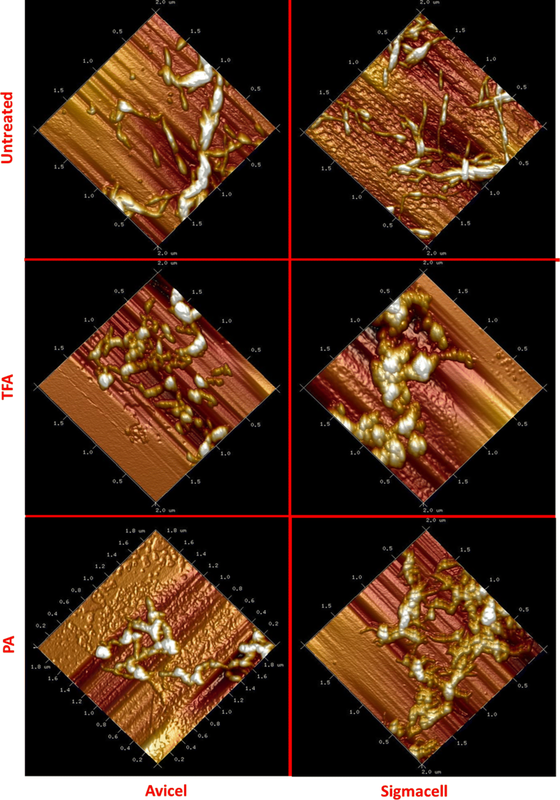 For the TFA-treated celluloses, the cellulose Iα [1 1 0] lattice plane was shifted from 2θ value of 16° to a higher 2θ value, merging with cellulose Iβ 2θ value. The intensity for [0 0 2] lattice plane was significantly decreased and shifted angle to a lower 2θ value. For the PA-treated celluloses, the intensity for [0 0 2] lattice plane was further weakened compared to TFA-treated celluloses and shifted to a lower 2θ value. It is noticed that cellulose Iα and Iβ [1 1 0] plane lattice signals were not detected, while [1 1 0] lattice plane with 2θ value 12.2° was observed for both A-PA and S-PA. TFA-treated celluloses did not have 2θ values for [1 1 0] that corresponded to PA-treated celluloses. Both PA- and TFA-treated spectra show the transition of cellulose I to cellulose II. 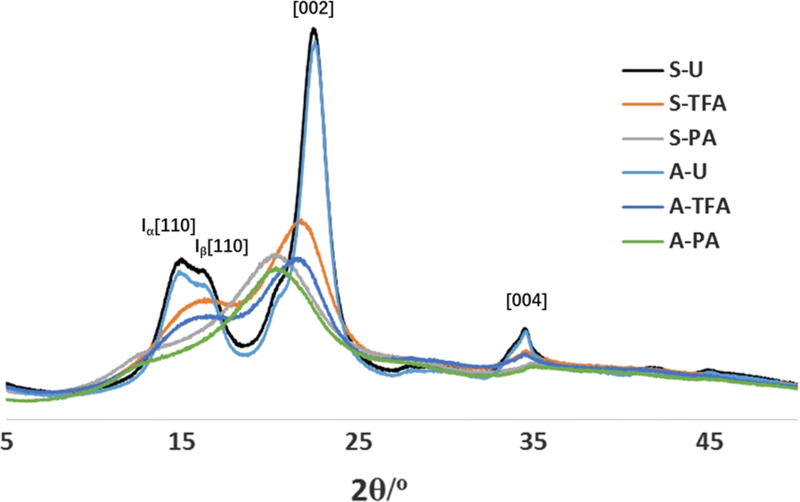 PA treatment resulted in a 2θ value of 12°, representing the [1 1 0] lattice plane of cellulose II. 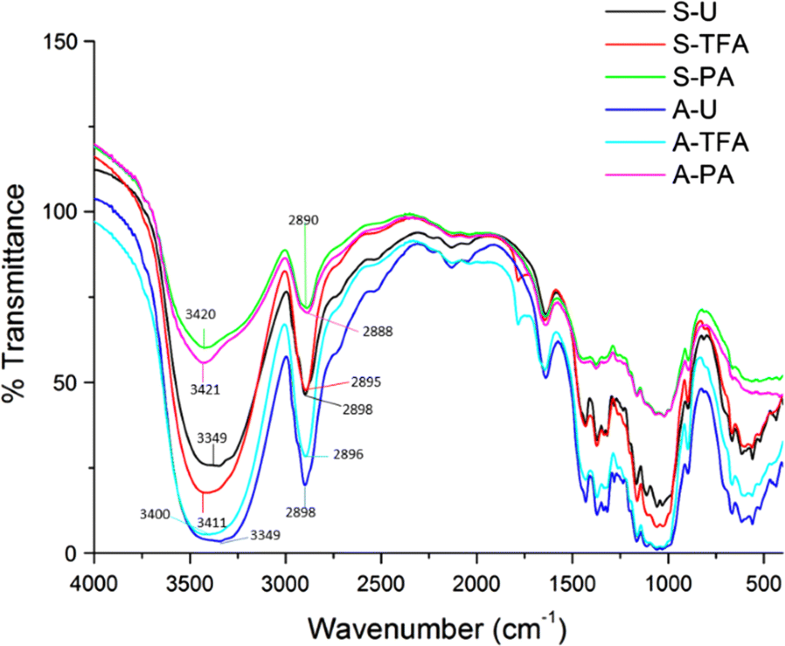 TFA treatment resulted in a cellulose I [1 1 0] increased angle shift from 16.5° to close to [2 0 0] [20, 21, 22, 23].